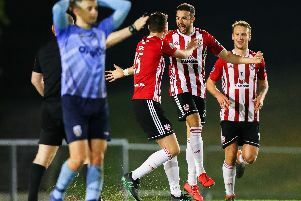 Derry City's Dean Jarvis is in line for a return to the starting line-up for tonight's EA Sports Cup quarter-final against Cork City. The ‘Candy Stripes’ will be hoping to get back on track following last Friday night’s 2-0 defeat to Sligo Rovers which ended the club’s nine match unbeaten run. And while Shiels expects a tough test against a Cork side which has won their last four games at home and defeated Waterford 7-0 in the last round, he remains hopeful of reaching the semi-finals. “It will be a tough game definitely but it’s one we aspire to do well in,” said the Derry manager. “We know it’s going to be hard but hopefully we can achieve some success. “We play Cork twice now in close proximity and the team who loses the first one certainly has something to prove to themselves and supporters. We’ll go there and put out as strong a team as we possibly can to try and get some of that momentum back. “It’s the one we didn’t want because of the travel involved and where it is in the calendar but that’s the luck of the draw. It will be a tough game definitely but it’s one we aspire to do well in. We know it’s going to be hard but hopefully we can achieve some success. Defenders, Aaron Barry and Dean Jarvis are in contention to start tonight’s match after a spell on the sidelines through injury. However, Gareth McGlynn, who scored in the 3-1 win over Fanad United for the Reserves on Sunday, isn’t expected to feature while Harry Monaghan (knee) has been ruled out. Cork City manager, John Caulfield meanwhile has promised to make at least 10 changes for tonight’s game but expects his side to have enough to see them into the next round. “We have had a really, really intense couple of weeks, going back to the EA Sports Cup game against Waterford. We are going to make at least 10 changes, but the good thing is that Conor McCarthy, Chiedozie Ogbene, Cian Coleman and Craig Donnellan all come into play, as well as the lads who would have been on the bench. The good thing is that we have a very strong bench and it is important for them all to get a run. “I would prefer not to make as many changes, but we have no choice with the volume of games we have had. However, I am still confident with the players we have coming in, because they are all guys who have been in the first team, so we will still be very strong and I am expecting us to win the match. Kenny Browne will miss out through suspension, having been given an additional two game ban after his sending off against Finn Harps.